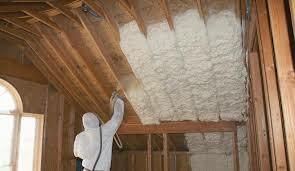 Spray polyurethane foam is widely promoted as a green building material for its ability to improve energy efficiency. It insulates better per inch than fiberglass or cellulose, which can mean major energy saving on heating and cooling. However, energy efficiency isn’t the only consideration when it comes to sustainable building. A closer look at spray foam’s chemical makeup reveals a number of substances that are known to be hazardous. Spray polyurethane foam consists of two liquid chemical components, referred to as “Side A” and “Side B,” that are mixed at the site of installation. Side A is mostly made up of isocyanates, while Side B usually contains polyol, flame retardants and amine catalysts. These chemicals create hazardous fumes during the application, which is why installers and nearby workers should wear personal protective gear during this process. Once the foam has fully expanded and dried, manufacturers say it is inert. If the chemicals are not properly mixed, they may not react fully and can remain toxic. The risks associated with the isocyanate of Side A are relatively well-documented, but risks associated with Side B are less well understood. David Marlow at the Centers for Disease Control has been researching off-gassing associated with spray foam installation since 2010. Although Marlow was unavailable for interview, the Public Affairs office at the CDC was able to provide information about his ongoing research via email. These field studies aim to determine the extent of exposure to all the chemical components of spray foam, determine a better understanding of curing rates and establish safe reentry times, and develop engineering controls to reduce the risk of exposure. In addition to the dangers associated with installation, these chemicals can potentially remain unreacted in the form of dust or shavings. TheEnvironmental Protection Agency warns: “Cutting or trimming the foam as it hardens (tack-free phase) may generate dust that may contain unreacted isocyanates and other chemicals.” This is also a concern during the process of removing foam. Homeowner Keri Rimel says she and her husband have both become extremely sensitive to isocyanates and other chemical smells following exposure during spray foam installation. “He still to this day can walk into any restaurant, home or office and he can immediately tell if there’s spray foam in a building,” said Rimel of her husband. According to the CDC, direct contact with isocyanates can also cause a rash if it comes in contact with the skin. Amine catalysts are one of the Side B chemicals that the CDC is researching, in an effort to understand the levels of exposure during installation. “Amine catalysts in [spray polyurethane foam] may be sensitizers and irritants that can cause blurry vision (halo effect),” they write. Also found in side B, polyols are alcohols that serve as catalysts. Polyols are usually made from adipic acid and ethylene glycol or propylene oxide. Some polyols are made from soy, but according to the Pharos Project, an organization that advocates for building material transparency, the soy-based material makes up just 10 percent of the final insulation. Ethylene glycol, a chemical used to produce polyol in some spray foam, can in cases of acute exposure (such as swallowing) cause vomiting, convulsions and affect the central nervous system. According to the EPA, exposure by inhalation can cause irritation in the upper respiratory system and studies in animals have shown kidney failure. Flame retardants are added to Side B to pass flammability tests in building codes. The main fire retardants used in spray foam are hexabromocyclododecane (HBCD or HBCDD) and tris(1-chloro-2-propyl) phosphate (TCPP). According to the Centers for Disease Control, “flame retardants, such as halogenated compounds, are persistent bio accumulative and toxic chemicals.” Bioaccumulation means that a chemical builds up in the body faster than it can be flushed out, so there can be a risk of chronic poisoning even if the level of exposure is low. The chemicals also build up in the ecosystem, where they enter the food chain. A paper by Vytenis Babrauskas published in the journal Building Research & Information says that, “flame retardants whose primary use is in building insulation are found at increasing levels in household dust, human body fluids and in the environment.” The paper also cites several other studies that show these chemicals are associated with endocrine disruption and are potentially carcinogenic.